Most Likely to Succeed. Best Athlete. Class Clown. Ever wonder what your parents, or grandparents, were like when they were in high school? The pages of a yearbook often provide valuable insights into our ancestors' lives, yet they are one of the best-kept secrets for genealogy research. Not only will you find small photos of a particular individual, as well as everyone he or she went to school with, you're likely to see pictures of the basketball or football teams in their uniforms, snapshots from the high school dances or homecoming parade, and interesting little tidbits such as an ancestor's nickname, career aspirations or even a personal "motto." Yearbooks can be found in a variety of places, both online and off. Here are some resources for you to use to locate the yearbooks for your ancestors. Look for yearbooks for all of the years that your ancestor would have attended that school. It's not just seniors who were included in photos and lists! The very first place to look for old yearbooks is at home. If you don't have them, ask all of your relatives to check the boxes in their attics or basements. If you no longer have access to your yearbooks, there are a few places you can search for them online. Archives.com. Check Archives.com (subscription required) for yearbooks from across the U.S. for grade schools, middle schools, high schools, colleges and universities, and the military. Ancestry.com. Search Ancestry's U.S. School Yearbooks database. It features yearbooks from elementary schools, middle schools, high schools, and colleges/universities from all over the United States. To get to the database, you will need a paid Ancestry.com subscription, or access through a library subscribing to Ancestry Library Edition. 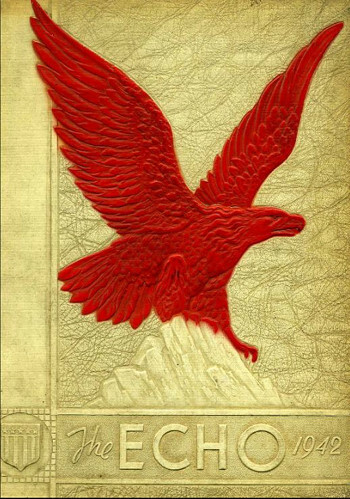 Once you've accessed Ancestry.com, go to the card catalog and search for U.S. School Yearbooks. Although there is some overlap here and at Archives.com, it's worth searching both since there are unique titles in each collection. eBay. You can also find old yearbooks for sale on eBay, and you can save your searches and receive email notifications about newly listed items matching your search criteria. Library and historical society websites. Be sure to look at the website of the local public library and historical society. A growing number are digitizing their collections and putting them online. For example, the Kokomo-Howard County Public Library, the Greentown Public Library, and the Howard County Historical Society worked together to digitize and publish online 50 years of Howard County, Indiana high school yearbooks. If you're unsuccessful finding a particular yearbook online, contact the school's alumni office and/or library. Check if the high school has a website. For colleges and universities, the following resources can help you: Find Universities; Alumni and Genealogy Education; and College Blue Book (published by Gale Group; available in many libraries). Some schools even have their own online yearbook collections or directories. For example, see Early Students at Notre Dame. Check local libraries, historical societies and museums for yearbooks in their collections. (Worldcat.org is an excellent way to find these.) Flea markets and auctions in the area are also good places to look for yearbooks. Sites such as LinkedIn and Facebook enable you connect with your classmates (or those of your ancestor), and other, alumni or reunite virtually with friends any time you'd like--so there's no need to wait for that 25th class reunion! There are pages dedicated to high school, college and other educational institutions, so you're likely to find your alma mater listed. Town and community pages may also help you make some connections. Also, use Google or check with Geneabloggers to see if there are any blogs about the town or the school. Class lists. These usually include a photo so you can see how Grandma looked when she was a high school senior. Family connections. It's possible that a yearbook will feature siblings at the same school. If not, look for other students with the same last name in other grades; they could be relatives. Interests and hobbies. What activities, sports, and clubs did your father participate in? Was Aunt Thelma the Student Government President, or Uncle Pete voted the "brainiest?" History. A history of the school or town may be included in the yearbook. In the themes and pages, you're likely to see influences from current events, fads, and pop culture. Notice the fashions and hairstyles. What domestic or world situations or happenings concerned and influenced students most? 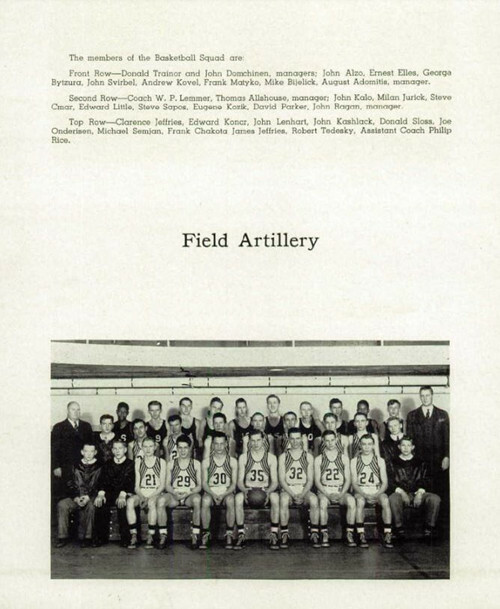 I located the 1942 yearbook for Duquesne High School on Archives.com and found my father (who was a junior) in the picture of the basketball team (shown below). It was interesting to browse through the yearbook, which had a "War" theme--an interesting reflection of the time period. The quote at the beginning of the book was: "There shall be wars...and rumors of wars" and the book dedicated to those in service of their country. The Principal is called the "Commander-in-Chief," and teachers listed as "Generals"--each of them getting their own telegram-like descriptions. For example, the basketball coach, "a booming voice...he manufactures...championship teams...born to command...typical Duquesners." One female teacher is described as: "capable...fair...ready to laugh...disliked by no one." The pages of a high school or college yearbook can help pinpoint an individual in a particular time and place, and may provide valuable clues that will lead you to other records. These snapshots in time help us to see beyond the dashes and lines of our pedigree charts, and gain an understanding of the daily lives of our ancestors.